The baculovirus-insect cell expression system utilizes recombinant baculoviruses (insect viruses) and their ability to manufacture high yields of biologically active proteins from infected insect cells. The proteins of interest can be easily purified from infected cells or their supernatants using tag and affinity chromatography. At Creative BioMart, our team of experts have developed baculovirus-insect cell expression platform for virus production and recombinant protein manufacture in various scales. The ability of Creative BioMart’s baculovirus-insect cell system to express proteins with complex post-translational modifications (PTMs), combining with high production yield, makes it perfectly suitable for generating mammalian proteins, especially cellular signaling proteins including protein kinases, protein phosphatases and cellular protein substrates, amongst others. In order to adapt to different purposes of our customers’, Creative BioMart offers various approaches to generate a recombinant baculovirus system containing the gene of interest. Bac-to-Bac Requires integration with baculovirus shuttle vector (Bacmid) in bacterial host cell before transfection. flashBAC Transfection with linear DNA, recombination occurs within host insect cells. Deletion of orf1629 enables better secretion of recombinant protein. BaculoGOLD Transfection with linear DNA, recombination occurs within host insect cells. BaculoDirect Pre-linearized DNA. Requires Ganciclovir in culture. BestBac Transfection with linear DNA, enhance production of target protein. Sf9 and Sf21 Spodoptera frugiperda All general types of recombinant protein expression. MimicTM Sf9 Spodoptera frugiperda Expression of mammalian glycoproteins. High FiveTM Trichoplusia ni Secretion of recombinant proteins. Shorter culture period. Figure 2. 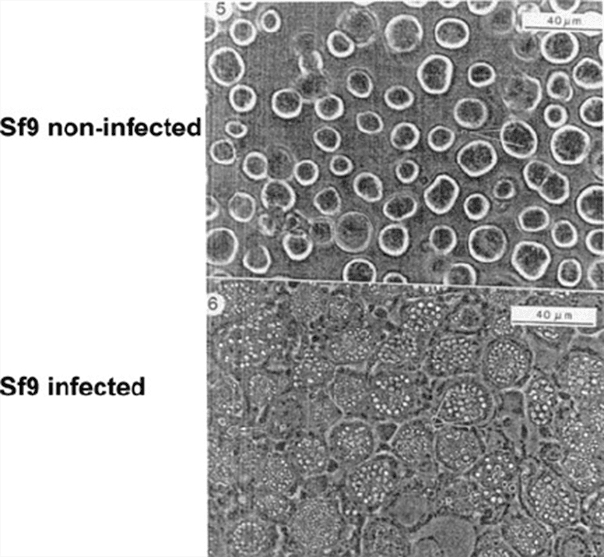 EM photos of non-infected and infected Sf9 cells. Operational safety: baculovirus are noninfectious to vertebrates. Contact us immediately to get your customized program! Unger T and Peleg Y. Recombinant Protein Expression in the Baculovirus-Infected Insect Cell System. Methods Mol Biol. 2012;800:187-99. doi: 10.1007/978-1-61779-349-3_13.